Anderson, James L., and W. Edwin Hemphill. The 1843 Biography of John C. Calhoun: Was R.M.T. Hunter Its Author? Journal of Southern History 38 (August 1972): 469-74. Atwell, Priscilla Ann. Freedom and Diversity: Continuity in the Political Tradition of Thomas Jefferson and John C. Calhoun. Ph.D. dissertation, University of California, Los Angeles, 1967. Boller, Paul F., Jr. Calhoun on Liberty. South Atlantic Quarterly 66 (Summer 1967): 395-408. Boucher, Chauncy S., and Robert Preston Brooks, eds. Correspondence Addressed to John C. Calhoun, 1837-1849. In Annual Report of the American Historical Association for the Year 1929, vol. 2, pp. 125-570. Washington: Government Printing Office, 1930. Brasington, George F. Jackson, Calhoun, and State Rights. Emory University Quarterly 15 (October 1959): 168-75. Brent, Robert A. Between Calhoun and Webster: Clay in 1850. Southern Quarterly 8 (April 1970): 293-308. Brown, James Donnell. Rhetorical Fantasy in the Webster-Calhoun Debate on the Revenue Collection Bill of 1833. Ph.D. dissertation, University of Minnesota, 1977. Bundy, Judy. John C. Calhouns Reflections on Federalist No. Ten: The Concurrent Majority as a Foundation for American Pluralist Theory. Ph.D. dissertation, University of Houston, 1987. ___. A Reconsideration of John C. Calhouns Transition from Nationalism to Nullification. Journal of Southern History 14 (February-November 1948): 34-48. Reprinted in Thomas, John C. Calhoun: A Profile. ___. Calhoun and His Critics." Telos 118 (Winter 2000): 59-76. Clarke, James D. Calhoun and the Concept of Reactionary Enlightenment: An Examination of the Disquisition on Government. Ph.D. dissertation, University of Keele, 1982. Crall, Richard K., ed. The Works of John C. Calhoun. 6 vols. 1851-1856. Reprint. New York: Russell Russell, 1968. Calhouns A Disquisition on Government and A Discourse on the Constitution of the United States are reprinted in vol. 1. ___. John C. Calhoun, Philosopher of Reaction. Antioch Review 3 (Summer 1943): 223-34. Reprinted in Thomas, John C. Calhoun: A Profile. Dillenbeck, Bruce L. The Decade After Moses: The Political Legacy of John C. Calhoun. Ph.D. dissertation, Florida State University, 1990. Dodd, William E. John C. Calhoun. In Statesmen of the Old South; or, From Radicalism to Conservative Revolt, pp. 91-167. New York: Macmillan Co., 1911. Donoghue, Francis John. The Economic and Social Policies of John C. Calhoun. Ph.D. dissertation, Columbia University, 1969. Drucker, Peter F. A Key to American Politics: Calhouns Pluralism. Review of Politics 10 (1948): 412-26. Reprinted in Thomas, John C. Calhoun: A Profile. Eichert, Magdalen. A Consideration of the Interests Which Lay Behind the Attitudes of Benton, Clay, Webster, and Calhoun in the Development of Public Land Policy, 1830-1841. Ph.D. dissertation, New York University, 1950. ___. John C. Calhouns Land Policy of Cession. South Carolina Historical Magazine 55 (October 1954): 198-209. 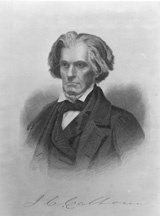 Erickson, David F. John C. Calhoun, South Carolina, and the Union." In The Shaping of American Liberalism: The Debates Over Ratification, Nullification, and Slavery, pp. 75-89. Chicago: University of Chicago Press, 1993. Ewing, Gretchen Garst. Duff Green, John C. Calhoun, and the Election of 1828. South Carolina Historical Magazine 79 (April 1978): 126-37. Ford, Lacy K., Jr. Inventing the Concurrent Majority: Madison, Calhoun, and the Problem of Majoritarianism in American Thought. Journal of Southern History 60 (February 1994): 19-58. ___. Republican Ideology in a Slave Society: The Political Economy of John C. Calhoun. Journal of Southern History 54 (August 1988): 405-24. Freehling, William W. Spoilsmen and Interests in the Thought and Career of John C. Calhoun. Journal of American History 52 (July 1965): 25-42. Reprinted in Thomas, John C. Calhoun: A Profile. Garson, Robert A. Proslavery as Political Theory: The Examples of John C. Calhoun and George Fitzhugh. South Atlantic Quarterly 84 (Spring 1985): 197-212. Harp, Gillis J. Taylor, Calhoun, and the Decline of a Theory of Political Disharmony. Journal of the History of Ideas 46 (January-March 1985): 107-20. Harris, J. William. Last of the Classical Republicans: An Interpretation of John C. Calhoun. Civil War History 30 (September 1984): 255-67. Harrison, Lowell H.  A Cast-Iron Man: John C. Calhoun. American History Illustrated 9 (February 1975): 4-9, 43-49. Heckscher, Gunnar. Calhouns Idea of Concurrent Majority and the Constitutional Theory of Hegel. American Political Science Review 33 (August 1939): 585-90. Hill, C. William. Contrasting Themes in the Political Theories of Jefferson, Calhoun, and John Taylor of Caroline. Publius 6 (Summer 1976): 73-91. Hizer, Trenton E. John C. Calhouns Early Nationalism. Masters thesis, University of South Carolina, 1990. Hofstadter, Richard. John C. Calhoun: The Marx of the Master Class. In The American Political Tradition and the Men Who Made It, pp. 86-117. 1948. Reprint. New York: Alfred A. Knopf, 1973. Jameson, J. Franklin, ed. Correspondence of John C. Calhoun. In Annual Report of the American Historical Association for the Year 1899, vol. 2. Washington: Government Printing Office, 1900. Jeffrey, Robert Campbell, Jr. The Thought of John C. Calhoun: The Key to the Liberal Critique of American Politics. Ph.D. dissertation, University of Dallas, 1985. Johnson, Gerald W. Americas Silver Age: The Statecraft of Clay-Webster-Calhoun. New York: Harper Brothers, 1939. Kateb, George. The Majority Principle: Calhoun and His Antecedents. Political Science Quarterly 84 (December 1969): 583-605. Lander, Ernest McPherson, Jr. The Calhoun-Preston Feud, 1836-1842. South Carolina Historical Magazine 59 (January 1958): 24-37. Lerner, Ralph. Calhouns New Science of Politics. American Political Science Review 57 (December 1963): 918-32. Reprinted in Thomas, John C. Calhoun: A Profile. Lindsey, David. Andrew Jackson and John C. Calhoun. Woodbury, NY: Barrons Educational Series, 1973. Maier, Pauline. The Road Not Taken: Nullification, John C. Calhoun, and the Revolutionary Tradition in South Carolina. South Carolina Historical Magazine 82 (January 1981): 1-19. Marmor, Theodore R. Anti-Industrialism and the Old South: The Agrarian Perspective of John C. Calhoun. Comparative Studies in Society and History 9 (July 1967): 377-406. Moore, Frederick W., ed. Calhoun as Seen by His Political Friends: Letters of Duff Green, Dixon H. Lewis, Richard K. Cralle1 During the Period from 1831 to 1848. Publications of the Southern History Association 7 (May 1903): 159-69; (July 1903): 269-91; (September 1903): 353-61; (November 1903): 419-26. Ogburn, Charlton. The Constitutional Principles of John C. Calhoun. Journal of Public Law 2 (Fall 1953): 303-13. Putterman, Theodore L. Calhouns Realism? History of Political Thought 12 (Spring 1991): 107-24. Rice, Daryl H. John C. Calhoun. History of Political Thought 12 (Summer 1991): 317-28. Riven, Audrey A. John Taylor, John C. Calhoun, and Roger B. Taney: The Three Views of States Rights. Masters thesis, Vanderbilt University, 1960. Silbey, Joel H. John C. Calhoun and the Limits of Southern Congressional Unity, 1841-1850. Historian 30 (November 1967): 58-71. Swan, Giles J. The Political Philosophy of John C. Calhoun. Ph.D. dissertation, New York University, 1909. Thatcher, Harold W. American Government and Politics: Calhoun and Federal Reinforcement of State Laws. American Political Science Review 36 (October 1942): 873-80. Volpe, Michael. The Logic of Calhouns Constitutional Theory. Southern Speech Communication Journal 39 (Winter 1973): 161-72. Walker, Mary Meade. Problems of Majority Rule in the Political Thought of James Madison and John C. Calhoun. Ph.D. dissertation, Indiana University, 1971. Walmsley, James. The Return of John C. Calhoun to the Senate in 1845. In Annual Report of the American Historical Association for the Year 1913, vol. 1, pp. 159-65. Washington: Government Printing Office, 1915. Wiltse, Charles M. Calhoun: An Interpretation. Proceedings of the South Carolina Historical Association (1948): 26-38. ___. Calhouns Democracy. Journal of Politics 3 (May 1941): 210-23. ___. Calhoun and the Modern State. Virginia Quarterly Review 13 (Summer 1937): 396-408. ___. A Critical Southerner: John C. Calhoun on the Revolutions of 1848. Journal of Southern History 15 (August 1949): 299-310. Woods, John A. The Political Philosophy of John C. Calhoun. Ph.D. dissertation, University of Rochester, 1953.